Let us suppose you meet a master of the spiritual life, someone who has approached the beatific vision, and who feels the oneness of existence in the embrace of God. This person has necessarily walked in your shoes, and can help you find your way. Would you have a question? What might you ask? And when the master spoke, how would you listen? If the master gave advice which went against the grain with you, how would you respond? If the concept of “living in the presence of the soul” touches you, this book will support and deepen that feeling, because one of the strengths of a well-told biography is that it sets ideas in a narrative context and illustrates them from life. When the thought is brought to life, it is not received simply as an abstract idea: it’s presented in an informative landscape, and therefore we more readily understand and relate to it. Further, wihtout wishing to sound maudlin, I always find that the aging and eventual death of the main figures adds a feeling element. If it is handled lightly, as it is here, sickness infuses one’s reading with a soft autumnal poignancy, and the book swells to its inevitable human climax. Death is always the master’s final teaching. What’s in this story? It’s basically the tale of Sy Ginsburg’s relationship with Ashish, the Scotsman Alexander Phipps, who went to India during WWII, where he settled and became a Vaishnav monk, gradually achieving wide recognition as a guru. Ginsburg travelled to meet Ashish in Mirtola, India, in 1978, remaining in contact with him, in person and by correspondence, until Ashish’s death in 1997. So it is partly Sy’s autobiography and partly a biography of Ashish, or at least of those parts of their lives which came into contact along the road of pilgrimage. 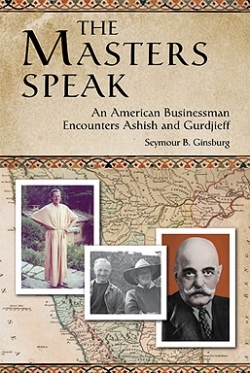 Early on, Ashish advised Ginsburg to join a Gurdjieff group in the USA, which Ginsburg did, meeting some of the senior identities in the international Gurdjieff groups, and eventually co-founding a new one, the Gurdjieff Institute of Florida. This is the narrative spine of the book, while it’s fleshed, so to speak, with Ashish’s letters to Ginsburg and four of his essays (these occupy the entirety of chapters 5, 10, 14 and 15). In addition to Ashish’s own writings, now made more accessible than before, some motifs dominate the book. Perhaps the most apparent theme is that of the “master”: who or what is a master, and what relationship is possible with one? Here the answer is sketched, rather than defined, as it were. We watch the master as he gently undermines Ginsburg’s notions of his own identity. Few of us will have had the worldly success which Ginsburg did, but that doesn’t count for much in this context, as his confident assumptions are scrutinized in the light of Ashish’s transcendent perspective and values. If we share Ginsburg’s aspirations to pierce the veils of the world, we can share in his search, and perhaps even sense that we, too, are living in a “limited state of ego-integration”. Ginsburg makes no claims whatsoever to have transcended that state. Neither does he claim to be humble. He just tells his story, leaving interpretation and judgment to the reader. This leads directly to what Ashish called “the whole game of finding the true person, the true identity, not the personality of this life only, but the identity with what has been there through the whole series of lives.” The letter continues, stating that the mind cannot serve two masters: “It either serves Sy or it serves the Self.” (p.132). In 1981, Ashish wrote to Ginsburg about his pursuing a spiritual goal. The lines blaze with an almost acid illumination: “Seymour Ginsburg will never find it. Seymour Ginsburg is a tissue of sensations and memories.” (p.59). I’d like to pause for a moment here: it’s ideal not to rush past such a question. Am I, too, a “tissue of sensations and memories”? And if I’m not, what am I? A worthwhile answer can only come from my own experience. One of the very most critical significance of this book is the extraordinary quality of Ashish’s thought on, it seems, any topic that came before him. It is not just that Ashish wrote well, although he certainly did that: “Security is an inescapable factor, but I would prefer a risk of robbery to living in a bank vault.” (p.99). Ashish’s thought had a rare quality: he could follow a thread of thought over the years, and not lose sight of it. The thread he held in mind was the challenge he addressed to “Sy” to question the motives and understanding from which he was manifesting, and to reconsider from a more impartial perspective every position he would find himself in. The entire book tells that tale. In respect of the seemingly indefatigable scepticism which Ginsburg felt, and which probably saved him from pursuing some rather pointless avenues, Ashish had a fabulous line: “The intellect is a lawyer who argues in behalf of the person who pays him” (p.60, and don’t miss a different approach to the same line of thought at p.147). For another memorable formulation, see the “mamba bite” quip at p.139: it is as true as it is witty. The G groups offer a method of changing … but offer no reason why anyone should want to change, except out of a sense of the meaninglessness of life as it is. No resolution is made merely by mixing two poles. While G himself was there, he provided the “something extra”. If Theosophy has degenerated into a new religion, so has the G work. Rare individuals may exist in both movements, but this does not prove anything. They also exist within Christianity or any other religion (p.97). Analysis of another line is offered by Ginsburg’s question about the notion present in his Gurdjieff group that one needs a connection directly with the “inner circle of humanity”, and that this connection was available through the groups because their “hierarchical leadership” is itself (still) connected with Gurdjieff (p.135). Ashish’s observation was succinct: “It’s complete bosh! These are things which get put out in the vested interests of the hierarchy …” (p.136). Ginsburg wrote to Ashish in 1983 that many people in Gurdjieff groups had conceded that they had attained nothing, “even after many years of the Work …” (p.66). Yet, Ginsburg gives some particularly deft descriptions of the practical methods at pp.53, 101-2 and 113-5. From whence comes, then, this lack of a harvest when the field is rich and the tools are available? Ashish stated, quite truly, in 1981 that “one has to be able to stop thought”, and that if becoming aware of sensation helps one to do so, then one should use that technique. But he also stressed the need for awareness of thought (pp.43-4), (I might add, confident that Ashish would agree, awareness of feeling). Remember G’s saying that one has to put someone onto the step one is standing on before one can move up to the next. This is not to be taken too literally. The point is that dedication to all that inheres in the unity of being will result in a sort of altruism which leads one to help others – who are oneself. Helping others, even before one has that transcendental perception, helps to attune one to its truth (p.139). Ashish actually practised service, and he did so in more than spreading ideas and practices, good as such work is. Similarly, Gurdjieff ran his own soup kitchen from his back stairs, where he fed a stream of paupers. Gurdjieff also, I believe, hid people from the Nazis (I think I have only read a general reference to this in Gurdjieff: Anatomy of a Myth. If anyone has more detailed evidence of this or any of Gurdjieff’s charitable works, I would like to hear from them at Joseph.Azize@googlemail.com). Ashish’s service, as disclosed in this book, was in sustainable agriculture. He started on his own property, and then helped people around him. Ashish also addressed a wider audience about these matters through his writings (p.35). So Ashish’s efforts embraced the two necessary spheres of altruism: those who are near myself and those who are further away. In any service, we need to balance effectiveness and practicality on the one hand with aspiration on the other. To this I would add what Catholics call “the principle of subsidiarity”. That is, aid should be delivered as closely as possible to the intended destination, by people as close as possible to that destination. Part of subsidiarity is that there should be a minimum of brokers and co-betweens. Overall, the best aid is that which directly and effectively helps people to help themselves. Too often, charitable schemes are rather like arranging for the people in one city to brush the teeth of people in another city. Gurdjieff had the insight that I first need to learn how to brush my own teeth. Then, perhaps I can help others. But I think that Ashish’s statement “Helping others, even before one has that transcendental perception, helps to attune one to its truth” provides a necessary balance to Gurdjieff’s “become a good egotist first”. My own involvement in charitable work has convinced me of its truth. I have seen people becoming more available to feeling, more sensitive, through doing such work. Often we do not appreciate the need for it until we do it. Certainly, I did not really appreciate this until I started the hands-on work of helping the handicapped. Once, while feeding someone with cerebral palsy, I had the feeling-realization: “this man is like me and I am like him, the differences are trivial”. I almost felt that I was him and vice versa. This is a truth which I think Gurdjieff’s emphasis on first becoming a good egotist may have had the unwitting effect of obscuring. I doubt that Gurdjieff meant for people to pass from being “good egotists” to becoming “damn wonderful egotists”. And it would be remiss not to mention that in certain cases the Gurdjieff groups have in fact proceeded beyond “good egotism” to altruism, chiefly by establishing schools (such as in Oregon, where Mrs Staveley established one on the group property). I will be glad to hear from readers of any instances where they are involved in say, hospice work, or assisting the homeless. There are many odd points I would like to discuss, but the review would end up as long as the book. The book is very well written. Ginsburg does not intrude himself and his personality, but his sound intellectual portfolio is everywhere apparent. If you are interested in what Ashish and Ginsburg have to say about dreams, and I would suggest that the interest is worthwhile, you could do worse than read pages 39, 59 and 95, in addition to those tagged in the index. Ashish’s comments on knowledge in his letter of 6 March 1981 are priceless (p.59). I relish the wry understatement of this comment from 1986: “Contrived symbolic buildings are usually flops” (p.99). Ashish’s comments on the development of “mental sciences” strike me as true to what I know of them. His statement of the true value of studying insanity is both deep and extraordinarily well phrased (p.124, he says that studying the insane can show us tendencies in ourselves which were so slight that we could not have identified them without first seeing them writ large). I personally accept Sai Baba’s status as a man of spiritual attainment. … his status ‘shows through’ his words: it is not in his words as such. As to his statement that he is ‘God’, it is true that in his essential nature he stands united with the divine unity. So do we all. As he himself says, ‘I know it. You don’t’. Ashish went on to add the important rider that “if he is God, he is God in a limited vehicle.” (p.25) Nisarga Datta is said to have likewise claimed that like all of us, he is God, but whereas he knows it, we are ignorant (p.27). When young, we were almost drunk on such high-sounding phrases, but I think it’s a sign of immaturity to remain mesmerised by them. Far more real and truthful was Gurdjieff’s attitude which insisted that such as we are God is very far from us, and that while we may be in relation, we always remain separate. As for being God, when Zuber told Gurdjieff that he “created” films, Gurdjieff roared at him: “You? You create nothing!”, if he did not use stronger language (I don’t have the volume Who Are You, Mr Gurdjieff? with me). In languages with a developed sense of the sacred, such as biblical Hebrew and Syriac, the verb “to create” can only be used of God. And rightly so. Ashish’s willingness to “accept” Sai Baba’s status strikes me as anomalous, especially given his forthright comments on Jung (“… he is writing arrant nonsense”, p. 236). I could explain why in some detail, but this review is already long enough. It suffices to cite two pieces of proverbial wisdom. From the English language, “You don’t have to taste the whole sea to know that it’s salty”, and from Lebanese, “maa metit, bus shifit meen mairt”, or “I haven’t died but I’ve seen (those) who have died”. I would make exactly the same comments in respect of channelling (chapter 11) and “masters” of the Koot Hoomi variety. I don’t like to be so dismissive, it can come across as arrogant. But that is how I see it, and if that’s arrogance, I shall have to wear it. I accept that Sai Baba has done a tremendous amount of philanthropical work, and he deserves full and unstinted credit for that. I’ll leave the topic while I can speak well of him. I noted two minor typographical errors at pp. 79 (‘Fontainebleu” for “Fontainebleau”) and 136 “Its ridiculous” for “It’s ridiculous”). Finally, the technique Gurdjieff taught, and which Ginsburg refers to at p.221, did indeed become known as the “sitting”, and some, like Ginsburg, call it “meditation”. But I believe that Gurdjieff himself referred to it as a “preparation”. Certainly, George and Helen Adie did, and Dr Sophia Wellbeloved tells me that Henriette Lannes, who taught that technique, did so too. This is not an insignificant point. “Sitting” and “meditation” import practices well known from Hindu, Buddhist and other traditions. In Beelzebub, Gurdjieff refers to “Aiëssirittoorassnian-contemplation”. He could have said “sitting” or “meditation”, but he didn’t. And it is not the same as any other practice I have ever come across. If I am correct that Aiëssirittoorassnian-contemplation is the foundation of Gurdjieff’s practical teaching, then to assimilate it, even by subliminal suggestion with different practices, should be avoided. Ashish’s wisdom and writings changed my prejudiced view of what I could expect from a Scotsman living in India. Beyond that, I feel that in reading this book I received an education. It’s a solid book. It’s very good, indeed.